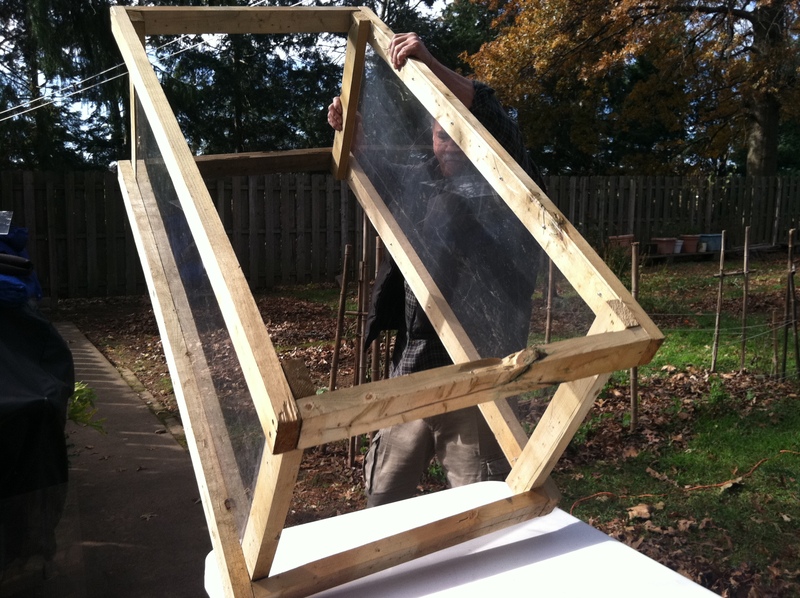 The first Raíces cold frame, under construction. It’s been a mild winter in central NJ. The warm days have us already anticipating the beginning of our planting season, really just a few weeks away for the cool weather crops. We just worked out our seed order with a group of gardening friends and Raíces Eco-Culture supporters and can’t wait to get planting this spring. There are probably still a few more freezes and frosts coming before we start spending long days outside again, but just because this isn’t the height of the gardening season it doesn’t mean that we aren’t working on our micro farm plots. For many gardeners, the winter months are for planning and preparing for spring, reflecting and researching, learning, studying and taking the time to work on projects, like the one featured in this post, to enhance their garden spaces. In 2012, the Raíces crew cultivated enough produce from our small patches of land that we were able to feed ourselves mostly from our own garden plants. Whatever we couldn’t grow enough of, we could find in abundance at the farmers’ market, all organic and locally grown. We weren’t looking forward to the winter, when our gardens would lay dormant and empty, and we would have to venture to the local food co-op for our organic produce. But as the traditional growing season came to an end, we became inspired to figure out how to extend our gardening season into the winter so we could continue to eat fresh, homegrown food. 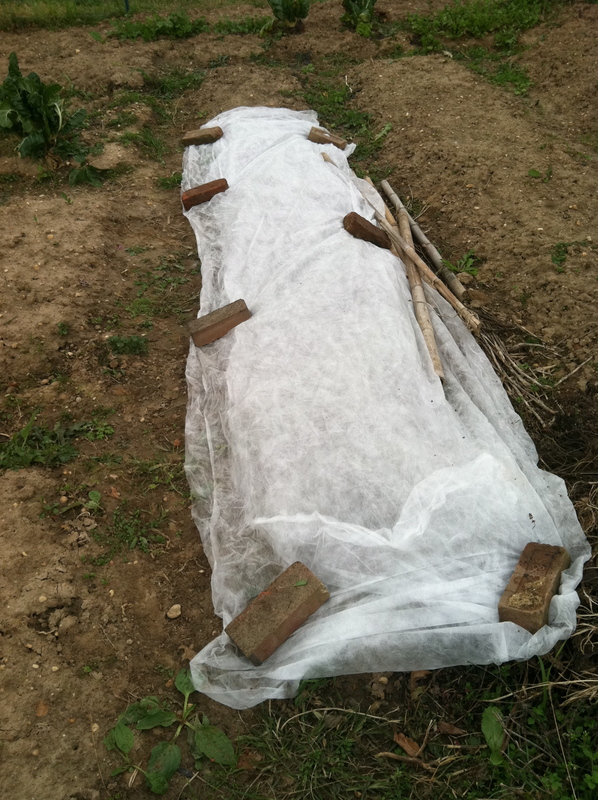 Covering crops with floating row covers protected our plants from the first frosts of the season and allowed us an extra harvest of black beans, green beans, lettuce and heirloom tomatoes. Plans for a greenhouse or high tunnel rolled through our minds, but without the materials or the amount of land needed to get to work on that, we adapted our ideas to the scale of one of our garden plots. We chose a plot that is filled with raised beds and decided to begin building removable cold frames to turn our beds into mini-green houses. We completed our first cold frame in November and so far it’s kept the soil in the raised bed from freezing and a set of carrots, kale and lettuce growing inside of it this winter. When we harvest in a month or two, we will be able to plant a seed bed inside, a few weeks earlier than we normally would in our climate zone. 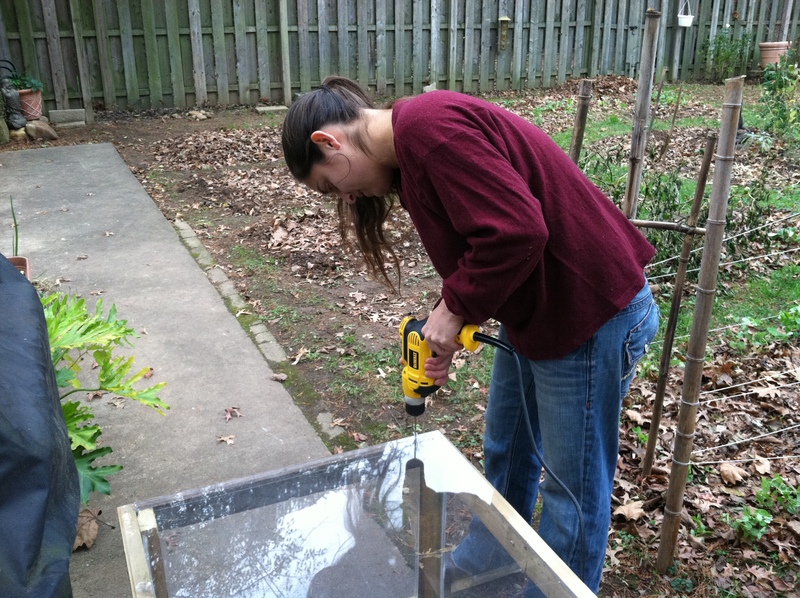 Building a cold frame/mini greenhouse. 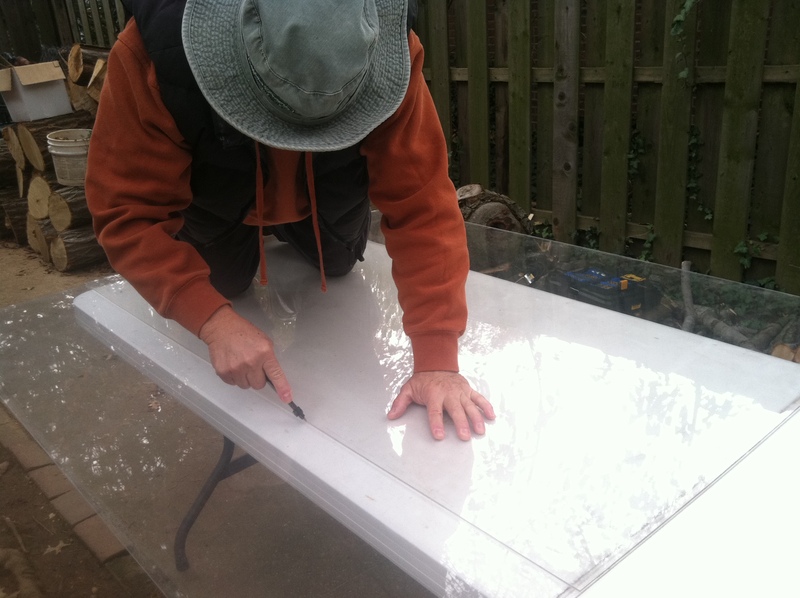 Cutting plexiglass sheets to the right dimension for our frame. Measure the raised bed that the cold frame will be attached to and record the dimensions. Our raised bed plot has eight raised beds, with eight different dimensions, so we have to remeasure for each cold frame we make. 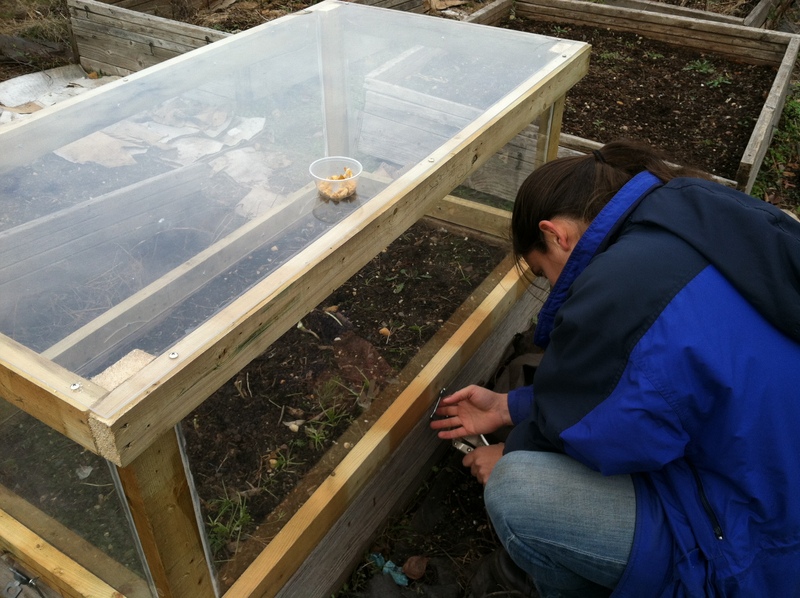 Determine the height of your cold frame. We wanted to grow kale, lettuce, kohlrabi and carrots. Once we rested the cold frame on our raised bed, we wanted at least two feet of growing space for the kale. 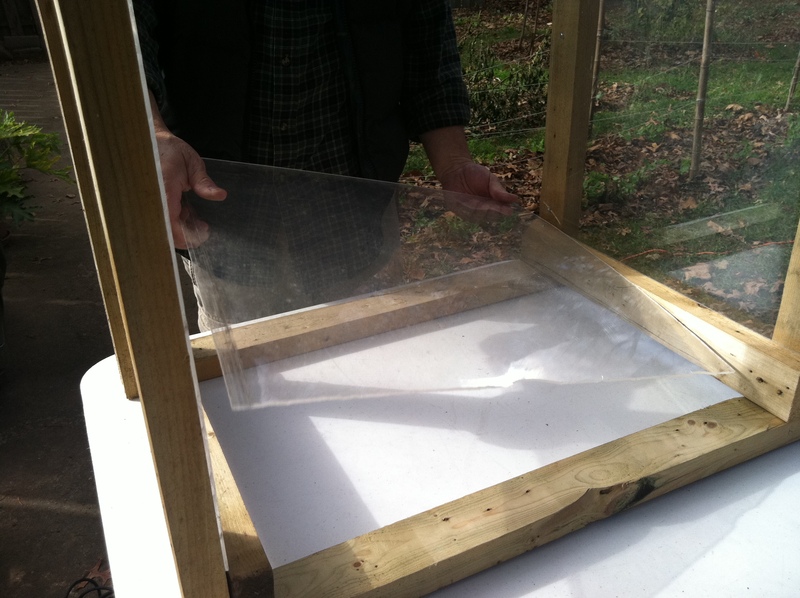 Placing the plexiglass sides in the coldframe. Our soil came to about 4 inches below the top of the bed so we decided on a 20 inch tall cold frame. 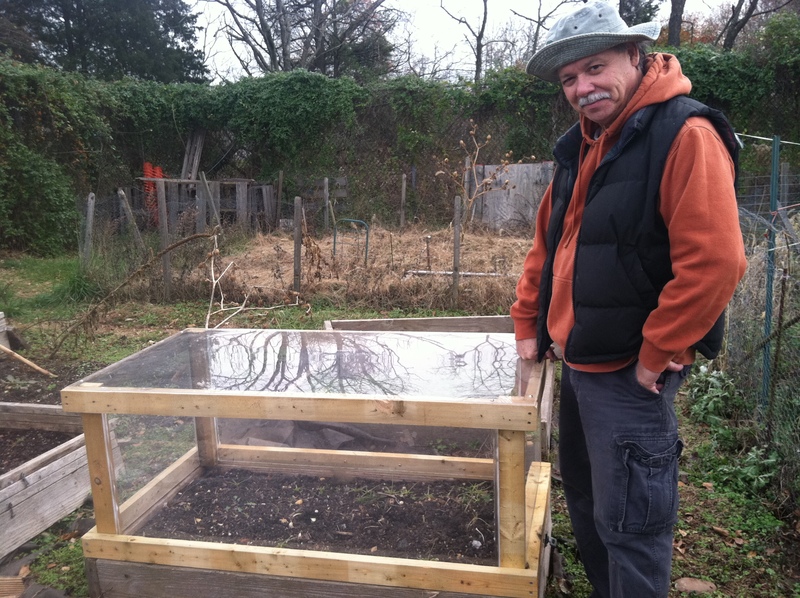 For shorter crops such as radishes and lettuce, a shorter cold frame would do. Measure and cut your 2” x 4”s. Assemble wooden frame with screws. Our frame was made from reused and recycled materials. Measure dimensions of top and sides and cut plexiglass to those dimensions. Drill holes for screws and screw plexiglass (carefully) into inside of frame for the sides and outside of frame for the top. Seal with caulk as needed. Rest frame on top of raised bed. Hook and eye latches attach the cold frame to the raised bed and help keep unwanted garden critters away from our plants. 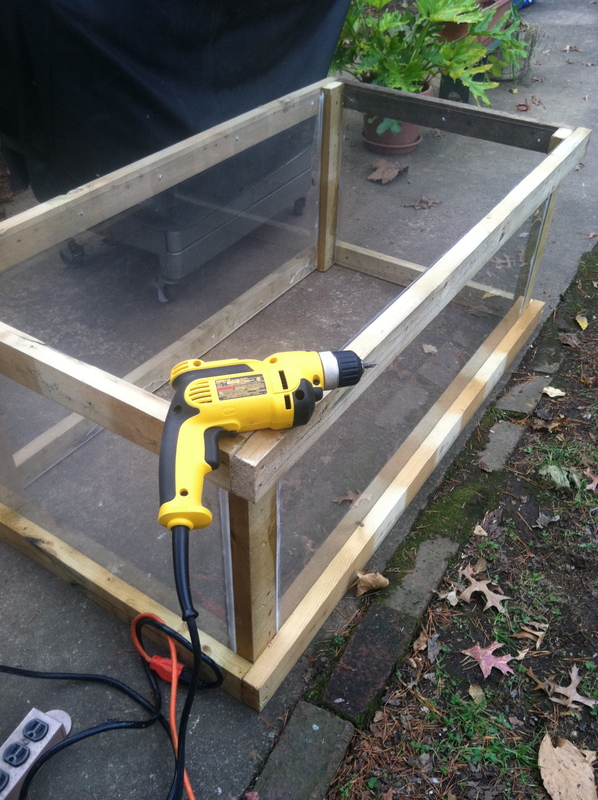 Install hook and eye fasteners to keep the critters out of your new mini-greenhouse/winter gardening cold-frame. Plant seeds or seedlings, keep them watered, watch them grow and enjoy your own homegrown winter veggies and herbs! Thanks for the encouragement! If you are building some, don’t hesitate to share your pics with us! Really thankful that you share these useful tips here! I’ll give it a try! Hope that I won’t ruin it!